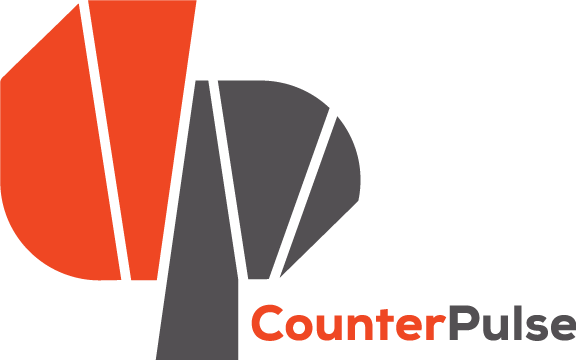 Justin designs strategic marketing activities to tell the story of CounterPulse’s compelling mission and work. He holds a B.A. in Journalism from CSU Monterey Bay and M.A. in Environment & Community from Humboldt State University. He works closely with artists to create compelling content on their artistic process, while his background in social science research spearheads the organization’s analytics. As a writer, his works have been published in InDance and SFMOMA’s Open Space platform, as well publishing a book of poetry. You can find Justin riding his bike through the city, performing at an Open Mic, or fastidiously cleaning on the weekend. As Operations Manager, Zerena organizes day to day financials and supports facilities management at CounterPulse to support its transition into a new space and expanding programming. Zerena is a recent graduate and holds a B.F.A from UC Berkeley. She is a practicing performing and multimedia artist based out of Oakland and her work has been exhibited at YBCA, SOMArts, and CounterPulse. In her professional and personal life Zerena seeks to creatively problem solve, educate, and act to recreate our reality. She spends her free time at drag shows, queer orgs, punk concerts, and art spaces. As Technical Director at CounterPulse, Justine oversees the operation of our theater and studios. Justine is currently a candidate for the Master of Arts in Museum Studies at San Francisco State University with an emphasis in Exhibition Design. She is currently working on exhibitions at the Global Museum at SFSU and for the SF SPCA’s 150th Anniversary. Outside of school and work, you can find Justine playing or watching soccer, at a bar trivia night, or on a trail. As Special Projects Manager, Jesse oversees the execution of CounterPulse’s annual Gala and other large happenings, assists in grant writing, and narrates new ways of imagining the circles of accountability that can and should fund the arts. He is a writer, curator, choreographer, and cook, and his work/life/food/art are all appropriately agitated, quite emotional, and full of futurist determination. As the Executive & Development Associate Yetunde assists in expanding CounterPulse’s development and fundraising capacity. With a long dedication to cultivating sustainable resource within diverse communities, they bring their passion for people and empowerment to the Development field. As a practicing artist they have worked with institutions such as SFMOMA, Oakland Museum of California, and Yerba Buena Center for the Arts. In their free time they can be found working on community-oriented projects with their art collective Blackmail, working on videos, and finding the next best costal vista point. As the Development & Engagement Fellow, Maya’s role is to learn more about development within the arts. Maya is currently a student at the University of San Francisco and majors in Performing Arts and Social Justice and will graduate December 2018. She enjoys practicing theatre and modern dance. She has also performed and various theatre and dance productions with the University of San Francisco and Tupac Amaru Theatre Arts program. Prior to joining CounterPulse, she worked as assistance dance instructor with GIRLFLY that featured teaching aerial dancing to young women within the Tenderloin. Maya enjoys spreading positive and restorative vibrations in the community through creative storytelling. Through CounterPulse, Phelps intersects grassroots community responsiveness with practices borrowed from tactical urbanism, placemaking and social innovation to co-create transformational experiences. Phelps recently spearheaded the process of acquiring and renovating a new building as the pilot project of the Community Arts Stabilization Trust (CAST). In collaboration with Jensen Architects Phelps designed a facility that is acclaimed by the public, press and featured in architectural reviews. Phelps has led the enterprising team of CounterPulse in funding and launching an acclaimed program of performing arts events, community-based programming, and international exchange projects. Phelps tours nationally and internationally as a speaker, U.S. representative, and dance artist. Min plans and oversees the artist residency and commissioning programs and is honored that it is their job to serve the artists and communities as part of CounterPulse’s movement for art and action. Min brings a dynamic balance of social and organizational skills from her beautifully windy path of studying narrative and image and existential philosophy at UC Berkeley, researching for schools and hospitals in management consulting, facilitating an interfaith spiritual center, and pursuing the unknowns of the creative unraveling process, with many different types of people and parts, plans, experiences, and learnings. You may find her / them / it dancing butoh through surreal and strange landscapes or philosophizing about the dance and revolution we need for our times in the long durational performance of this life.